This experiment investigated the antinutrients content and functional properties of the seeds of African black pear (Dacryodes edulis). The study derived its importance from the environmental problem posed by the seeds of this highly cherished fruit. The aim of the project was to determine through empirical means the possible recycling potential that might be inherent in the seeds of the African black pear. Three seed varieties of the same sample categorized as Small (S), Medium (M) and Large (L) were used for this study. Standard experimental protocols were employed in the estimation of all indices. Data obtained indicate that the seed samples contained phytic acid: 12.13 + 1.14; 12.37 + 1.82 and 13.37 + 0.65g/100g sample on dry matter basis (DMB), respectively for Small, Medium and Large. Trypsin inhibitory activities (TIA) were determined as 546.67 + 30.55; 520.00 + 20.00; and 473.33 + 23.10g/100g sample on DMB in the same order, respectively. High amounts of oxalate 0.24 + 0.02 g-1100g for Small; 0.35 + 0.03 g-1100g for Medium and 0.37 + 0.03 g-1100g for Large while tannins were also found to be (5.07 + 0.14; 5.16 + 0.08; 5.02 + 0.16)g-1100g for Small; Medium; and Large, respectively in the seeds. Water and oil absorption capacity as well as foam capacity and bulk density for all the samples did not differ significantly (P>0.05). The Medium seed flour, however, showed significantly (P<0.05) higher values in emulsion activity (40.82 + 1.52)% and foam stability (6.20 + 0.33)% as compared to foam stability of the Large seed (5.80 + 0.08)% variety. It may, therefore, be concluded from the strength of this novel results, that the seeds of Dacryodes edulis contained high amounts of phytic acid, oxalate, TIA and tannins. Physicochemical data on the other hand suggest the seeds of Dacryodes edulis to have valuable functional attributes of industrial interest. Anti-nutrients are bioactive components found in most tropical food materials. Legume seeds, root tubers and vegetables particularly contain bioactive components that interfere with several digestive enzymes and some micronutrients when consumed by humans or animals in their poorly or inadequately processed forms. There are several potentially useful tropical plant materials that have been left unutilized or underutilized due to inadequate knowledge of the occurrence and composition of limiting factors as well as the functionality that may be inherent in any of such plant material. The seed of Dacryodes edulis exemplifies one of such possible food items and it has been least studied. The African black pear or plum is one of the numerous indigenous tropical fruit trees. The fruit of African pear is highly cherished for its fruit pulp. Investigations into the chemical composition of the fruit revealed that its fruit is rich in lipids and contains substantial levels of protein, vitamins and minerals . The seeds of this fruit are often discarded after consuming the fruit pulp probably due to dearth of information as to the possible usefulness of the fruit seeds. A major factor limiting the wider food use of many plants and plant material is the ubiquitous occurrence in them of a diverse range of natural compounds capable of precipitating deleterious effects in man and animals. Knowledge of toxic substances naturally present in plant that are or may be used as food are useful in several ways since they affect the overall nutritional value of the food . The properties of food material are often generally attributed mainly to its protein content even though other food components such as carbohydrates, fat and crude fibre are known to make important contributions to its physicochemical characteristics . How the food components in the seeds of Dacryodes edulis may interact and function in food system during processing, manufacturing, storage and preparation is not well documented in literature even though the seeds of D. edulis have been reported to lack toxins and its use in feed suggested . The aim of this research is, therefore, to determine the functional properties of the seeds of Dacryodes edulis and to confirm the non-existence of toxic principles in the seeds as earlier reported . This works derives its importance from the fact the seeds of Dacryodes edulis constitute serious environmental waste problem whenever the fruit is in season. Three varieties of fresh, matured and ripe African black pear fruits were each obtained from the same parent tree and identified as Dacryodes edulis at the Botany department of Ambrose Alli University. These samples were divided into three categories on the basis of sizes as Small (S) fruit varieties [weight<14g], Medium (M) fruit type [weight>14<25g] and large (L) fruit type [weight>25g]. The seeds were carefully removed and each seed type oven dried at 60oC to constant weights. The dried seeds were differently pulverized using a domestic manual grinder (Victoria model) and each seed type was filtered through a 40mm sieve to obtain a fine powder for each seed type and stored separately in a dry container for use. Trypsin inhibitor was extracted by standard procedure  and evaluated as previously described . Polyphenol was extracted and quantified by the vannilin-HCl method . Extraction and precipitation of phytate was done  and phytate analysis was carried out as described . Oxalate was estimated as described. Briefly, the sample was extracted with water for three hours and calibration curve of oxalic acid prepared by making serial dilutions of standard oxalic acid solutions and then taking absorbance at 420nm, from where the oxalic acid content of the samples were extrapolated as oxalate . Water and oil absorption capacity, foam capacity and stability and emulsion activity of the seed flours were determined in triplicates . Bulk density of the samples was determined as described . Analysis of Variance was employed in testing data obtained from this study with the aid of computer Microsoft Excel Analyse-it statistical software (USA). LSD was used to determine differences in means at 95% confidence interval. The antinutrients composition of the seed varieties of African black pear are presented in Table I. There is a progressive but not significant (P>0.05) increase in phytic acid contents from small to large seed varieties. Tannin content is found to be higher in medium seeds compared with others and the observed variation in tannin value did not differ significantly (P>0.05) among the samples under consideration. There is a significant (P<0.05) reduction in Trypsin Inhibitory Activity (TIA) in large seed sample as compared to the other seed varieties. There is also a progressive and significant (P<0.05) increase in oxalate contents in the various seed types with small seeds having the least oxalate content. Physicochemical data did not show any difference (P>0.05) in water absorption, oil absorption and foam capacities and bulk densities in the three seed sample types. Significant (P<0.05) and same reduction patterns were observed in emulsion capacities and foam stabilities of small and large seeds compared to medium seed types (Table II). The three seed varieties examined in this project show the presence of phytic acid, tannins, oxalate and trypsin inhibitor in the raw sample of D. edulis seed flour. The values obtained for tannins in the different samples investigated in this project are slightly above 5% of the dry matter (Table I). The values represent both hydrolysable and condensed tannins in each case. The mean values reported here for tannins in the seed flours are far above those reported for some legumes . This study did not attempt to categorize the contents of the tannins types and hence drawing specific conclusion with respect to the nutritional implication of tannins presence in samples under study is limited. However, it suffices to comprehend condensed tannins as least in nutritional significance due to their low solubility and extractability . The high tannins content in Dacryodes edulis samples implies severe nutritional challenge to animals or humans due to its affinity for certain digestive enzymes and proline-rich proteins in the saliva as well as its interaction with protein and starch to form complexes resistant to enzyme hydrolysis and cause depress utilization of protein and starch after consumption . The oxalate contents of Dacryodes edulis seeds as shown in Table 1, is high in comparison to those reported for legumes and is in same range as those for spinach, beet leaves, tea and lower than that of cocoa [3, 15]. Irrespective of the high oxalate content in Dacryodes edulis samples, it fell short of the lethal (4-5g) dose for adult . The oxalate contents in samples studied increased significantly (P<0.05) between small and medium seed sizes but not with medium and large. The major problem associated with excessive oxalate consumption is its ability to form water soluble salts with some mono and divalent ions particularly Na+, K+, NH4+, Ca2+, Mg2+ and Fe2+ and therefore making its bioavailability a challenge. Phytic acid and trypsin inhibitor appear to be the principal factors to limit the utilization of this plant material. The amount found in both phytic acid and trypsin inhibitors are higher than those present in tropical legumes . The implication of high phytic acid consumption is the induction of mineral deficiency through the formation of insoluble salts with divalent metals particularly calcium, magnesium, iron and zinc, making these unavailable to the body. Phytic acid may also react with protein or any of these minerals to either form phytate-protein complex or phytate-cation-protein complex. In addition to these, antioxidant enzymes requiring zinc as cofactors are inhibited while erythropoesis may become impaired due to non-iron availability. There is a significant (P<0.05) reduction in trypsin inhibitory activity between small and large seed size [13, 17]. The high levels of trypsin inhibitor and phytic acid in the samples under study may account for why the plant material is seldom consumed by lower animals particularly rodents. Unlike the seeds of Dacryodes edulis, the trypsin types present in legumes have been determined . The three seed flours of Dacryodes edulis studied appears to have high potentials for water and oil absorption, foam capacity and bulk density as there are no significant differences (P>0.05) among these values ( Table II). The high water uptake observed for the three samples may likely be as result of protein and damaged starch contents in the samples. Water absorption capacity is a useful attribute in bakeries as it enables freshness in products. The oil absorption capacity of the seed flour may be considered high due to the fact that a gram of sample is able to absorb 75% and above of its weight. The mechanism of oil absorption has been attributed to the physical entrapment oil and its binding to the polar chains of proteins. This implies that the high oil absorption capacity of the seed flour may be due to the presence of polar amino acids in its composition. However other physical properties such as fat and carbohydrates, including bulk density that is observed to be high in the samples under study are also known to contribute to oil absorption in samples . Foaming capacity among the three seed flours did not differ significantly (P>0.05), while foaming stabilized significantly (P<0.05) in the medium size seed flour. The values stated here for foam capacity and stability are low when compared to those reported for legumes . The reason for the observed poor foam capacity may probably be attributed to the lipid contents of the seed flour as these were not defatted before use. The significant increases in foam stability and emulsification property observed in medium size seed flour can be linked to variations in lipids as well as proteins in the seed samples, because it has been suggested that foam stability and emulsification activity are related to protein denaturation and protein contents respectively . Therefore the higher the protein content in sample the longer it takes for it to become denatured thereby prolonging protein-stabilized foams. A high emulsification activity is also a desired attribute in dairy formulation. The degree of water and oil absorption, including foam capacity and stability observed in this study are lower in comparison to those reported for peanut flour . The reason for these differences may be due to the protein rich nature of peanuts that is a legume compared to D. edulis seed that is indeed a plum. The experimental values obtained from this study suggest need for thorough processing of Dacryodes edulis seeds if it is to be of value in feed formulation due to its high content in oxalate, tannins, phytate and trypsin inhibitory activity. Inspite of its potential limitations, the seeds under study appears to have some functional attributes which could be exploited particularly in the food and feed industries. There is need therefore flowing from the observation made from this study, to determine the trypsin types present in the seeds of Dacryodes edulis as has been done for legumes. This finding will enlighten on whether trypsin or a combination of it and chymotrypsin are inhibited when the seed of Dacryodes edulis is consumed. Umoti U and A Okiy Characterization and composition of of the pulp oil and cake of the African pear, Dacryodes edulis (G. Don) H. J. Lam. J. Sci. Food Agric. 1987; 38: 6772. Osagie AU Antinutritional Factors. In: Nutritional Quality of Plant Foods. Anthony, U. Osagie and Offiong, U. Eka (Eds). Post Harvest Research Unit (University of Benin). Benin City. 1998; pp. 221- 224. Onimawo IA and PI Akubor Food Chemistry. Ambik Press Ltd. Benin City, Nigeria. 2005: P. 208. Obasi NBB and NP Okolie Nutritional constituents of the seeds of the African pear, Dacryodes edulis. Food Chem. 1993; 46: 297  299. Aletor VA, Ali ABD, EL-Moneim and AV GoodChild Evaluation of the seed of selected lines of three lathyrus spp for b-n-oxalyamino-1-alanine (boa); tannins, trypsin inhibitory activity and certain in-vitro characteristics. J. Sci. Food Agric. 1994; 65: 143-151. Smith C, Megen VM, Twaalfhoven I and C Hitchcock The determination of trypsin inhibitor levels in food stuffs. J. Sci. Food Agric. 1980; 31: 341-350. Price ML, Van Scoyoc S and LG Butter A critical evaluation of the vannilin reaction as an assay for tannin in sorghum grain. J. Agric. Food Chem. 1978; 26(5): 1214-1218. Makower RV Extraction and determination of Phytic acid in beans (phaseolus vulgaris). Cereal Chem. 1970; 47: 288-292. Wheeler EL and RE Ferrel A method for phytic acid determination in wheat fractions. Cereal Chem. 1971; 48: 312-316. Ketiku AO and OT Adepoju Protein Quality, Dietary Fibre Composition and Antinutritional Factors of Shea-butter (Butyrosspermum paradoxum Gaertn.f.) fruit Pulp. Nig. J. Nutr. Sci. 2004; 25 (2): 28-33. Beuchat LR Functional and Electrophoretic Characteristics of Peanut Flour Protein. J. Agric. Food Chem. 1977; 25: 258-261. Liener IE Implications of Antinutritional components in soybean foods. Crit. Rev. Food Sci. and Nutr. 1994; 34: 31-67. Aletor VA Allelochemicals in plants food and feeding stuffs: 1. Nutritional, biochemical and physiopathological aspects in animal production. Vet. and Human Toxicol. 1993; 35(1): 57-67. Butler LG and KD Bos Analysis and characterization of tannins in faba beans, cereals and other seeds. A literature review. Proceedings of the 2nd International Workshop on Antinutritional Factors in Legume seeds. Wageningen.1993; 81-89. Azeke MA Characterization and improvement of the nutritional value of African yambean (Sphenostylis stenocarpa) by nontraditional processing methods. Shaker Verlag. Germany. 2003;Pp. 15-250. Ross AB, Savage GP, Martin RJ and L Vanhanen Oxalates in Oca (New Zealand Yam) (Oxalis tuberose Mol.). J. Agric. and Food Chem. 1999; 47: 5019-5022. Nolan KB, Duffin FA and DJ Mcweeney Effect of phytate on mineral bioavailability. In vitro studies on Mg, Ca, Fe, Cu and Zn (also Cd) solubilities in the presence of phytates. J. Sci. of Food and Agric. 1987; 40: 79-85. Grant G, Ewen SWB, Bardocz S and A Pusztai Enzyme inhibitors from legume seeds can interfere with the body metabolism of animals. 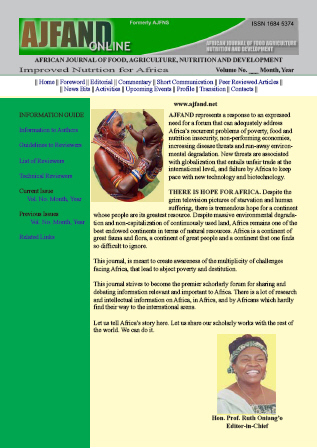 COST 98: Effect of Antinutrients on the Nutritional Value of Legume Diets 1996; 1: 60-68. Kinsella JE Functional Properties of Protein in Foods. A Survey CRC Critical Review. Food Sci. and Nutr. 1979; 7: 219-280. Afam-anene OC and LN Onuoha Nutritional and Functional Properties of Sesame. Nig. J. Nutr. Sci. 2006; 27. (.1): 16-21. Yatsumatsa K, Sawada K, Moritaku S, Misaki M, Tada J, Wada J and K Ishii Whipping and Emulsifying Properties of Soybean Products. J. Agric and Bio Chem. 1972; 36: 719.